In early times, the darkly glorious yew-tree was probably the only evergreen tree in Britain. Both Druids with their belief in reincarnation, and later Christians with their teaching of the resurrection, regarded it as a natural emblem of everlasting life. Its capacity for great age: enriched its symbolic value. The Yew plant, Taxus baccata, is sometimes used in the treatment of breast and ovarian cancer. 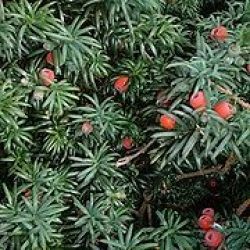 Yew plant is native to Europe and prefers moist alkaline soils in an open sunny position. Drought and frost resistant. An evergreen tree, growing to 20m x 4m. Be the first to review “Yew, plant” Click here to cancel reply.